Baby Hazel is playing dress-up and your little one is the designer! Let your tiny fashionista set the mood, tone and color for creating whatever outfit that their heart desires. 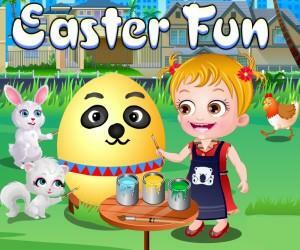 Featuring one-click controls this game is easy to play and offers choices limited only by the players imagination. Players can select from 6 different hairstyles in a nearly endless number of colors. Whether it’s pigtails, buns, bobs or tomboy, the hair raising choices are sure to please. Ranging from fun to formal, your youngster will love being Hazel’s hairdresser. Select a dress for romping in a meadow or attending the Prince’s Ball. Suitable for kissing a frog or dancing the waltz, the many dress choices are sure to provide options for any style. With 30 unique garments to choose from, players can create a look to match any mood. 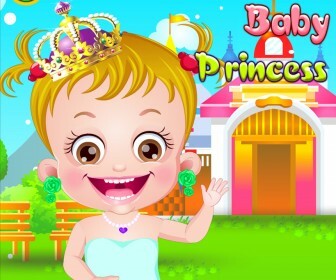 Featuring 18 tiara, necklace and earring choices, Baby Hazel can be transformed from a pauper to a princess with the click of a mouse. Offering a dazzling array of colors, the accessories will help to turn your tyke’s character into the vision of their dreams. Bare feet? What’s a Princess to do? Not to worry. There are 9 sock options and 18 shoe options to finish off your little designer’s creation. Flats, heels, bows and straps will allow the player to find just the right image for the Princess in their mind’s eye. Once you have finished creating, you can change the scenery for your baby’s very own Hazel. Choose a country castle or a pretty palace for the backdrop. Finding the perfect residence for their new friend finishes off this fun, interactive activity. When you are finished, the art can be saved or printed, allowing it to be shared with friends and loved ones for years to come. Each time it is played the game offers an opportunity for an entirely different design. Allowing the ability to exercise both creativity and imagination, Baby Hazel Princess Dressup is sure to give hours of productive and enriching imagination enhancement. Help Baby Hazel become the most beautiful princess ever! 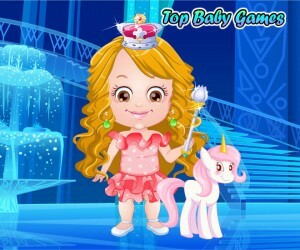 Dress her up with the most ravishing dress and give her the best hairstyle for the crown. Enjoy!